 Having been brought up in the traditions of Irish and Scots music for almost fifty years or so and being exposed to and having played with some of the best , I am completely sold on the passion that exudes from Christopher Deans Music, playing with such authority and expression that would suggest he feels the meaning and sentiment of each tune which is a rare gift. To hear Christopher playing from the heart is his gift to the listener and carries them to places they have not been before. Celtic Music is in his soul and when he plays he bares his soul to you." - Stevie Connor, Radio Show Host, "Wee Dan's Hoose"
"Ive listened to and watched your videos of Shenandoah, and If I Were a Carpenter, many times. Its like you make the notes sound to the ears as music, to the mind as words and to the soul as if one were in a far away place in a time long ago. Ive listened to many other versions on facebook, and some versions of these songs are pretty good, but just music. No others have the magic that takes the mind of the listener back to the originals they loved so much, and then stirs up the stored dreams and thoughts associated with these beloved tunes. Then, as the almost forgotten thoughts pass by, and the mind jumps from one foggy dream to the next, the listener realizes a spell has been cast. Thank God for the gift he has given you." "I was truly impressed with your performance last night. Thank you so much for giving me that experience. It was awesome! You have developed a very impressive on-stage persona and demeanor that brings the audience into the performance and share the richness and history of the individual pieces. Your craftsmanship with the instruments is enhanced by your ability to impart emotion to the melody and evoke individual memories by audience members." "Listening to Celtic Journey we can feel the experience of an important historical/musical journey; Dean lives every single passage, every note, every embellishment and we greedily plunder all his musical maturity...listening to Bonny At Morn or The Foggy Dew is really an astonishing experience hard to forget." "With Celtic Journey Christopher Dean gives us, with taste and experience, the magic of celtic music with its atmosphere wrapped in fog, legends and history. First-rate work." "... I fell in love with the woody resonance and bell-like sustain of Christopher Deans Taylor guitar and with the delicious picking style that he is rightly known for. The tunes and songs he plays are evocative of the Irish and Scots landscapes. The playing is emotional and reflective without being maudlin or sentimental. The melodies lift the spirit and weave a magic that sustains long after the last notes fade...."
"...American finger-picking guitarist heads up a collection of Irish and Scottish tunes and airs. The difference is that many of his choices are songs, including Bobby Sands's Back Home in Derry. These turn up trumps, his subtlety of touch working wonders; he can jig it too, but it is the song airs where he reigns supreme." "Listening to his third solo album, Celtic Journey, is the equivalent of lying in the soft green grass on one of Scotland's rolling hills. The music commands control of all your senses, easing your mind back into a calmer place." "Even though this is an album backed by impressive credentials, with expert production from an artist who obviously did his homework, what makes it enjoyable to listen to is the beauty of music. None of the qualifications matter, just the work. Celtic Journey is all substance." "...Listning to the complex harmonies that Dean playes on "Skye Boat Song", with simultanious lilting melodicism and full chording, or the delicacy which he lends to the Northumbrian tune "Bonny at Morn" is to know that this is, above all else, a guitar record." "...Dean makes each song accessible and bright  and with his playing the marvel that it is, there's not a dull or boring track here." Guitar Nine Records reports Christopher Dean's "The Gael" rated #3 in the top best selling album for Fingerstyle Guitar, and #9 best selling album in the Acoustic Guitar category. The companion 60 minute, 14 song compilation CD consisted of selections from such noted Celtic entertainers as Cathal McConnell, Fairport Convention, Duncan Chisholm (Wolfstone), Alyth McCormack, and many more. Two of Christopher Dean's tunes ("The Gael" and "Ye Banks and Braes") were selected to open and close this CD. From America, a sensitive, passionate and precise musician, that possesses a repertoire of Celtic song and ballad for the solo acoustic guitar. You can listen to his music on the compilation album accompanying this magazine. The topic of the guitar in Celtic music becomes richer with a new person. An artist with a diversified musical background and philosophy, who breaks away from the stereotype of a Celtic guitarist. We speak about the American, of Scottish heritage, Christopher Dean. He is introduced to us on this months Keltica music sampler with two selections from his last album, "The Gael". On many occasions we have listened to the "Celtic Guitarist" who prefers to play at supersonic speed, is able to impress us, but, because of a preference for that technique, does not hit the listener's imagination, to the detriment of emotional communication. Above all, with this kind of traditional music of Celtic origin, the result of this type of perspective does not allow the listener the important contemplative aspects associated with the interpretation of the melody. Obviously, reels, jigs and fiddle tunes (dance music) demand a dynamic approach, but many guitarists seem to concentrate on playing the instrument rather than the music. The music of Dean is exactly the opposite of this position. Very rarely have we heard a more sensitive and expressive guitarist who communicates through his Taylor guitar. At a first listening, you might even think that he could be an instrumentalist playing with a simplistic technique, but this is not the point: it would be unfair to name other guitarists, but rather than many guitarists with a muscular approach to the guitar fret board, he is a musician who succeeds to render, in a subline way, the expressiveness of the music, transposed on a difficult instrument, like the guitar. The relationship between Christopher Dean and the guitar began at an early age. At the age of five he received his first guitar from his grandfather, and was taught the rudimentary principals. It was an encounter that would mark his life in a definitive way, until today. The fifty-five year old musician began to perform professionally in 1966 in Tucson, Arizona, at the age of 18. His band, the Night Sounds, was a quartet specializing in rock and R&B, who toured the southern states of the U.S.A. (they were also the opening act for The Doors). After some years we find the guitarist in the Rick Durham Band, touring the Los Angeles area. Following, an artistic interval that coincides with military service. Upon his return to Tucson, Dean begins to study fingerpicking, and, after seven years (and moving to Southern California) he returns to public performance, but playing the banjo with a repertoire oriented towards bluegrass. From 1980 to 1986 it was the banjo that was mainly performed by Dean. During that time, he performed in a series of competitions in the category of bluegrass banjo. For the next 10 years (1986-1996) he stopped performing on a professional level in order to deepen the study of the history and characteristics of Scottish and Irish music. 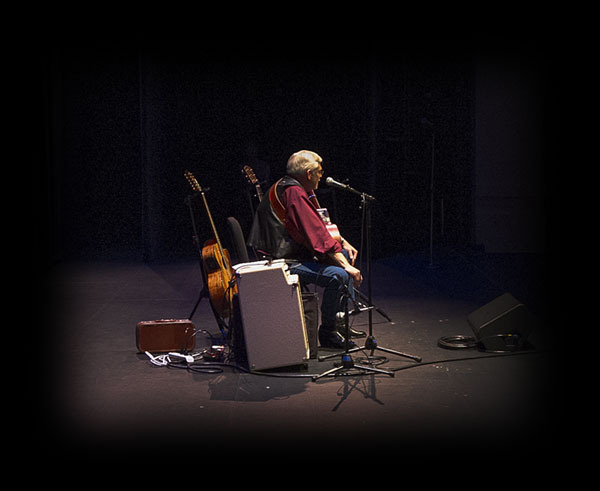 In 1996 he returns to public performance, and this time with a repertoire formed exclusively from traditional and contemporary folk music, arranged for fingerstyle guitar. In the course of the last years, his popularity has quickly grown, and the presence of Dean is now a consistent on the American Celtic folk music scene. The American guitarist traveled to Scotland in search of his own roots and family ties to the clan MacKay. His first album represents a superimposed image of a photograph he took on that trip. The panoramic photo of Ruthven, in the Highlands, was the scene of a battle when the English Queen sent her army to destroy the society of the clans. As a result of the encouragement of the popular Scottish artist, Dougie MacLean, Dean decided to record his first album, "Highland Heritage", which was published in the autumn of 2000. With the success of that Celtic guitar album , he released his second album, "The Gael", two years later. We introduce the readers of Keltika to the title track, "The Gael", and the evocative "Ye Banks and Braes O' Bonnie Doon". MacLean writes: "I have known Chris for several years both as a friend and a musician. He is an accomplished guitarist and is conscientious and committed about the style of music he chooses, to the extent that he has set up his own record label and released a fine, well researched album of Scottish and Irish tunes. He has a long association with the music business, having started as a teenager, to the present where he has recently performed with several notable figures in the Celtic arena, and which I feel is just recognition for his effort and ability. I also know he has been getting an excellent response at his gigs and I am sure this will continue to be the case. I am happy to support Chris in his efforts and to recommend him to you." The two pieces drawn from "The Gael" clearly introduce us to the artistic philosophy of this guitarist. His music is more relaxed and calm than the average of his colleagues (who rely on a typical repertoire of dance music). The beauty of the lyrics are transposed into his arrangements. It's not by chance that slow airs and ballads predominate on this album which seem to communicate to us the importance of the melody in the traditional music of Scotland and Ireland. "The Gael" is, perhaps, one of the most famous pieces of contemporary Celtic music. The tune was written by MacLean in 1990, and originates from his album "The Search". Two years after the release of that album the tune was chosen by 20th Century Fox for the movie soundtrack "The Last of the Mohicans". in 1995 MacLean was awarded a gold record for that contribution. In the last several years "The Gael" has been recorded by several musicians (in Italy it continues to be used in the spot advertising for a brand of whisky...), but we are proud to announce that Dean's arrangement is the first version for guitar. "Ye Banks and Braes O' Bonnie Doon" is a song written by Robert Burns. As in many cases, he wrote the lyrics and adapted them to a pre-existing fiddle tune, "The Caldonian Hunts Delight". In this version, Dean celebrates the arrangement of Tony McManus. The Gael can be acquired directly from the record house, Cairney Hill Music: telephone 001-619-258-2699; web http:www.cairneyhill.com; e-mail info@cairneyhill.com. "...Celtic music grips the imagination. It expresses the beauty and mystery inherent in the heartlands of the Celts - ancient lovely lands; ancient tragic stories; heartfelt love; fiery spirits of both the soul and Uisge beatha, the "water of life". The swirls and whorls of Celtic design symbolize life and love never ending - belief embodied in the skirling rhythms and grace notes of Celtic music. It is wholly remarkable that Christopher Dean's solo fingerstyle guitar can evoke the very soul of Celtic spirit and emotion in this exquisite recording. His choice of music is thoughtful and varied, wistful and stirring. The arrangements (save two) are his own. Chris plays with sensitivity and emotion, - just him and his expressive Taylor guitar. Ah, but his Irish and Scottish ancestry infuses the notes with mystery, and nostalgia, and pride. The notes are not just played, they are expressed lovingly, as if by a poetic bard who speaks to your very soul...."
Canadian author Rob Lockhart describes Dean's music beautifully. "It is wholly remarkable that Christopher Dean's solo fingerstyle guitar can evoke the very soul of Celtic spirit and emotion. His Irish and Scottish ancestry infuses the notes with mystery, and nostalgia, and pride. The notes are not just played, they are expressed lovingly, as if by a poetic bard who speaks to your very soul...."
With two Celtic albums already recorded, Dean remains loyal to the Celtic sounds of his musical heritage. His CD's, Highland Heritage and The Gael, were received with rave reviews. Dean also adds a humorous storytelling aspect to the music during his live shows. Although Christopher Dean's music may be more quiet and subtle than its energized Celtic dance counterpart, be forewarned: his beautiful ballads may just steel your heart! "...We've all heard flashy players who impress but don't move or engage us because their guitar work is more fingercraft than communication. It is apparent from Dean's deft yet unhurried execution that the goal is not to win a fingerpicking tournament, but to render each tune with an economy that lays bare its emotional wiring. Notes and phrases ring with purpose, and an intangible "something" (perhaps "soul" is a good word) emerges from the outlines of ages-old melodies and modal harmonies. Highland Heritage's deliberate pacing and hushed reverence draw you into an almost mysterious communion with the ancient Scots-Irish. It comes from an area in the heart reserved for reflection on the personal meaning of history, place, and bloodline. And it does not require being of Scottish or Irish descent to become enveloped in its poignancy and emotion." "...Chris Dean, also takes the relaxed approach on his 2000 release CD. This El Cajon-based guitarist, plays the locally made Taylor 612ce and 314ce, on the album. He is a former 5 string banjo contest winner who gets a very bright sound from his instruments. The CD includes several Celtic standards, "Mist Covered Mountains", "Wild Mountain Thyme", and "Danny Boy". He also performs Pierre Bensusan's "Voyage to Ireland" on this 11 track CD. All are done with great skill. Dean is a guitarist who favors a good deal of ornamentation in his performance as witnessed by this CD." "...While writing this Newsletter, I frequently play the CD "Highland Heritage" which features the sensitive, tranquil solo acoustic guitar playing of Christopher Dean. Now, Chris (who has Scottish roots but lives in Southern California) has produced another CD "The Gael" with a mixture of Scottish and Irish traditional and contemporary music, performed instrumentally on acoustic guitar. I've bought a copy and it is now on my "most often played" list"
"...The fingerstyle guitarist has already published "Highland Heritage" an album of traditional Celtic numbers done solo, and now he presents a second work, "The Gael" in which the guitar is multi tracked and in some numbers has some help from mandolinist Peter Lauderbach to construct a resonant tapestry of sound. Dean displays a certainty of tone - precise and controlled technology and volume... a pleasant and agreeable acoustic disc of guitar music that gathers some interesting things like "Dargai", "The Gael", and the peerless McManus arrangement of the traditional "Ye Banks And Braes 'O Bonnie Doon" which Dean brings to full light." Translation provided by Rob Lockhart and Franco Morone. "...If you enjoy traditional Celtic music and contemperorary Scottish and Irish music performed instrumentally on acoustic guitar, this CD is for you. Christopher Dean's The Gael offers us ten beautiful melodies in the traditional style of finger-picking that can soothe or bring about melancholy to jump up and "dance me a jig." .....Dean's arrangements on eight of the songs evoke visual images and, at times, you can almost hear bag pipes emulating from the strings."